Another Smash Bros. Nintendo Direct has come and gone. And while not all the new info was golden (Shovel Knight merely being an Assist Trophy instead of a playable character, another Fire Emblem clone character, etc. ), for the most part, there was a lot to get excited over. A dizzying number of stages and music, new items, Dark Samus as an additional clone character, the whole shebang. The biggest news, however, were the reveals of Simon (and Richter) Belmont from Castlevania and King K. Rool from Donkey Kong Country as new playable characters! Admittedly, rumors about Simon Belmont’s inclusion have been around for a while, but it’s still awesome to see its confirmation. And he even gets a clone in Richter Belmont. I guess on the downside, Alucard is relegated to an Assist Trophy, but I guess I can understand that. It’s just…Symphony of the Night is so good! Y’know? But no news from the Direct was more exciting for me than the reveal of DK’s archenemy, King K. Rool. I have to admit, it’s surprising he made it in before Dixie Kong, but as I’ve stated ad nauseam, I’m a huge DKC fan, and I just wanted an additional character from the series. I’m not greedy. Better still, Simon/Richter’s moves look to be pulled right out of the Castlevania games, and King K. Rool replicates his moves from his various boss fights throughout the DK series. Of course, now we have Ridley. And we have K. Rool. Now all we need is Geno, and the Triforce of Smash’s most wanted will be complete! Castlevania is one of the most storied franchises in gaming. It began with many memorable sidescrollers on the NES and SNES, before adopting a more explorative, Metroid-inspired style with the masterful Castlevania: Symphony of the Night. 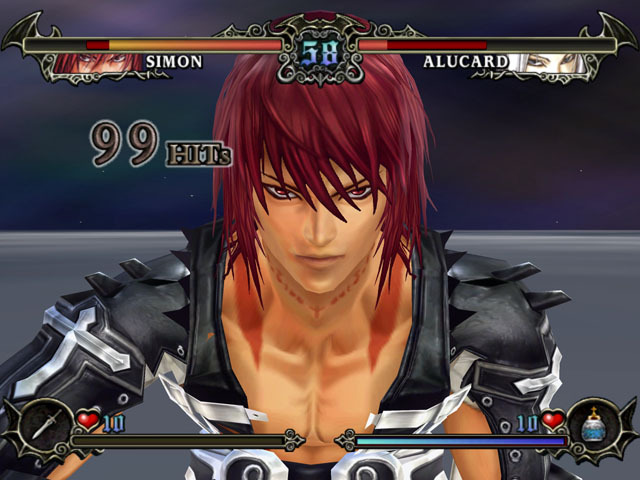 Of course, being the big franchise that it is, it was inevitable that Castlevania would also dabble in different genres, though its experimentation with other formulas hasn’t worked nearly as well as other franchises, with a good example of this being Castlevania Judgement, the first fighting game in the Castlevania series, released on the Nintendo Wii in 2009. The first thing to note about Castlevania Judgement is that it’s a 3D fighter, and history hasn’t been too kind to Castlevania’s 3D entries, especially when compared to just how beloved the 2D iterations are. Sadly, Castlevania Judgement was no exception, due primarily to poor controls, camerawork, and mechanics. The idea of a Castlevania fighter is actually an enticing one, and at first the game looks to have a lot of promise, with graphics that were quite good for the Wii, there’s a nice (if not limited) selection of characters, and an awesome soundtrack that recreates many iconic tunes from the series’ history. But it won’t be long into your first couple of matches that you begin to notice the game’s flaws. For starters, the game’s primary control scheme involves the Wii Remote and nunchuck, which is no problem on its own, but quickly becomes one with how the game utilizes them, and how it never meshes with the nature of the game itself. Players move their character using the joystick on the nunchuck attachment, while the buttons on the back are used to block. Meanwhile, the majority of the characters’ moves are performed with motion controls by swinging the Wii remote. The motion controls simply aren’t well implemented, and often times trying to perform a combo only ends up with you swinging the controller around like a madman, with varying results. Perhaps the motion controls would work better, if your character were automatically focused on your opponent, and if they weren’t coupled with a poor camera system. Unlike a 3D fighter like Soul Calibur, where the characters are always focused on one another, the fighters here move around so freely that oftentimes, when trying to perform a combo, the first move will hit your opponent and then your character will just keep going past them attacking the air, with the camera trying desperately to keep up with your character. The combination of poorly-implemented controls and camerawork are what ruin the core gameplay. Though players also have the option of using Wii Classic Controllers and GameCube controllers (which are most assuredly better options), they don’t fix the camera and character issues. With all this said, there are some small, nice touches to the game. At the start of versus matches, for example, players can select a secondary weapon to use in battle, with said weapons also being obtainable within the battlefield, and include the usual secondary items from the series like holy water, crusifixes and throwing knives. It’s a simple but welcome way to pay homage to the series traditions, as is the ability to pick up hearts to build up your power meter within matches. Sadly, Castlevania Judgement’s respect for its heritage, along with the aforementioned visuals and music (which are, again, quite good), are about as far as the compliments can go. Along with the faults in the core gameplay, there are other aspects of the game that are just disappointing. Castlevania Judgement has a host of modes in store, but they are nothing out of the ordinary for a fighting game. What’s a bit more peculiar is that the game’s story mode only allows you to play as Simon Belmont or Alucard from the start, with the other twelve characters (including those that are available from the start in other modes) needing to be unlocked. And once you unlock them, you may even regret what their stories have to offer (Maria’s story – the most infamous of the lot – revolves around her insecurity of the other Castlevania girls having larger bosoms than herself, which feels ridiculously far removed from the nature of Castlevania). Worse still, the AI in the game is wildly inconsistent in difficulty. I managed to defeat the first opponent in Alucard’s story mode with no problem (at least, no problem outside of the ones innately found in the gameplay). But the second opponent began repeatedly spamming the same combos over than over, with very little breathing room for me to block or fight back. 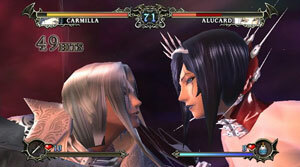 The idea of a Castlevania fighting game is not one that should have ended up this flawed. It’s easy to see where the potential was in Castlevania: Judgement, but in execution, it stumbles in just about everything but aesthetics and in fan service for the series. Perhaps a better idea for a Castlevania fighter would simply be to make it 2D and to utilize the same kind of fluid controls found in Symphony of the Night. Symphony already utilized moves that were performed like the combos in a fighter, if you put those same controls into the field of a fighting game, and you would have an absolutely incredible fighter. Instead, Castlevania’s debut in the fighting genre is remembered mainly for its awkward controls and poorly-implemented mechanics. But hey, at least the music’s good.